Corporate investors in Southeast Asia say they can invest with confidence in complex markets by working with a well-connected, customer-focused and forward-thinking partner - like Ascendas. hy establish a new Asian operation without local partners who can facilitate the process at every turn? Investors in IT space, industrial and logistics parks, science parks and mixed-use properties from Hyderabad to Ho Chi Minh City, Suzhou to Seoul, and in multiple other locations have found a partner in securing real estate in Singapore-based Ascendas. As a unit of JTC Corporation - a statutory board of Singapore's Ministry of Trade & Industry - Ascendas has the reach and resources investors will soon appreciate, virtually wherever in Asia they require space. Ascendas is much more than a service provider. Besides its chief role as developer, it operates the Ascendas Real Estate Investment Trust (A-REIT) formed in 2002, the Ascendas India Trust (a-iTrust) launched in 2007 and, since July 2012, the Ascendas Hospitality Trust (A-HTRUST) with hotel properties in China, Japan and Australia. It manages several private funds, too, with interests across Asia. Ascendas' competitive edge lies just not in its geography reach, which is significant, nor in its breadth of services, but rather in its development philosophy: Ascendas builds and maintains for the long-term integrated communities - those that provide a work-live-play-learn environment in one location. Prime examples are the International Tech Park Bangalore in India, Dalian Ascendas IT Park in China and the recently opened Changi City in Singapore's Changi Business Park adjacent to the city-state's international airport. In nearby Malaysia, Ascendas is now developing an integrated industrial park with UEM Sunrise Bhd in Nusajaya, part of Johor's Iskandar Malaysia development, that will cater to Singaporean and international industrial investors seeking business facilities, retail, residential and lifestyle amenities. Singapore has limited land resources, so the development will seek to draw companies based there that are seeking to expand without leaving the immediate area. Ideally, target companies (pharmaceutical, food processing, electronics, medical devices and logistics, among others) will establish not just a presence, but an integrated business ecosystem with their customers and suppliers at a location offering equidistant proximity to markets in China, India and other Southeast Asian markets. A new integrated industrial township is taking shape in India, 50 kilometers from Chennai, that illustrates Ascendas' development philosophy. The company operates two properties in Chennai already - International Tech Park Chennai and CyberVale - but these cater to investors seeking IT or BPO space. The 1,500-acre industrial township (a joint venture between Ascendas, IREO and a Japanese consortium comprising Mizuho Bank and JGC) anticipates the needs of a broader array of investors, including a Japanese automotive components manufacturer that has already broken ground on a new facility at the site, even as infrastructure is installed for additional investors in the future. International Tech Park Chennai, which opened in 2005, won the Gold Award in the Industrial category at the prestigious FIABCI Prix d' Excellence Awards 2013. This is the second consecutive FIABCI Prix d' Excellence Award for Ascendas India with the International Tech Park Bangalore winning it in 2012. This award recognizes projects that embody excellence in all real estate disciplines and illustrate the FIABCI ideal of providing society with the optimal solution to its property needs. Judging criteria include architecture and design, development and construction, financial and marketing, environmental impact and community benefits. "When companies come to India, their first motivation typically is cheap labor, but a more sustainable solution is required for business growth," says Dominic Leong, general manager, Ascendas India. "So we are creating an integrated space that is more than just manufacturing, because companies will still want to attract talent as they move up the value chain, not just as they start manufacturing operations. We are creating an environment where people can live, and where they can learn and enjoy entertainment. It's a new township away from Chennai." The Indian government makes industrial space available on the outskirts of Chennai, and many multinationals have taken advantage of the low land prices they find on those properties, such as the Oragadam industrial park. But these are merely land sites, and while companies' properties are secure, provide plenty of room for expansion and are an hour's truck trip to Chennai's ports, the parks lack the infrastructure (road maintenance for one) and amenities that a carefully and sustainably planned development like Ascendas' new township will offer. "That is how we are differentiating ourselves, by not just providing space for manufacturing, but providing the total environment for people to settle in for the long term," says Leong. Lifestyle amenities planned for the township include hotels, schools, medical centers, parks, residential space and gardens. More than 400 clients and 77,000 workers already occupy space on Ascendas properties in Chennai, Bangalore and Hyderabad, and the company also has joint venture stakes in developments in Pune and Gurgaon. In Chennai, the 15-acre International Tech Park is home to 56 clients and 19,000 workers in three LEED-certified, secure office buildings. Hotel operator Asiana operates a business hotel onsite, and two food courts cater to Western and Asian culinary tastes. CyberVale occupies 18 acres in the Mahindra World City development not far from the planned industrial township, south of Chennai. Renault-Nissan operates a state-of-the-art R&D center at CyberVale, just 15 kilometers from its manufacturing plant. Ascendas has a strong presence in nine countries including Singapore, China, India, South Korea, Malaysia, Vietnam and Australia. Elsewhere in India, Ascendas is completing Phase 1 of its International Tech Park Pune, which already is fully leased. And more than 6 million square feet of space is under development at two projects in Gurgaon - Ascendas OneHub Gurgaon and International Tech Park Gurgaon. Hyderabad is home to the The V, a 19-acre development with 1.2 million square feet of space; CyberPearl, a six-acre technology park where 5,000 people work; and the recently acquired aVance Business Hub with two buildings currently and more about to be purchased by a-iTrust. The Hyderabad properties are within two kilometers of each other in the city's high-tech district. A 100-acre development is getting underway near Bangalore International Airport that will complement the International Tech Park Bangalore (ITPB) in the busy Whitefield section of the city, the first phase of which opened in January 2000. ITPB is an Ascendas flagship tech park, with 30,000 workers and 250 clients in a variety of technology fields. Bangalore's IT economy has evolved in recent years from a location for IT services, call centers and BPO operations to higher value functions, including software development, animation, gaming and R&D. The park has its own power plant that guarantees a continuous energy supply and has been awarded the best decentralized power plant in Asia. Six voice and data service providers operate at the park, giving tenants options for those essential infrastructure needs. Other amenities include multi-story car parks, food courts, a nearly half-million-square-foot Ascendas Park Square shopping mall (complete with movie theater, bowling alley and plenty of dining options) and a five-star hotel - Vivanta by Taj. A residential building includes corporate apartments and private residences, and a bus parking system facilitates transportation for the many employees who commute to work that way. Ascendas organizes social activities, inter-park talent competitions and sporting events, making ITPB far more than a work destination. In fact, the integrated development philosophy being implemented at newer Ascendas properties was honed here and is simply being applied appropriately at other locations. "We pride ourselves on being India's first work-live-play environment, which is becoming more common now," says Anirban Choudhury, vice president, communications, Ascendas India. "The sincerest form of flattery is imitation," adds Joey Khoo, vice president, marketing & CS, Ascendas India. "But it was Ascendas that brought change to the IT industry here." India has "endless talent resources in IT, engineering and software development, and certainly in the Bangalore area this is the case as global technology engineering centers and other higher-value operations replace call centers and BPO operations, for example, as users of space." New space is coming online at ITPB in the form of a special economic zone (SEZ) for IT companies, giving them the option of staying at ITPB in the case of existing companies that want to remain in the park and an attractive location with tax-exemption benefits for new investors. "The principle is the same as with other SEZs – companies must export their work," says Khoo. "The software developed here, for example, does not stay here." Companies in the IT SEZ also realize customs tax benefits on the computers and equipment brought to the location for use by the tenants. Companies resident in the non-SEZ part of ITPB will continue to benefit from Software Technology Park of India (STPI) incentives from the federal government. "We are creating an integrated space that is about more than just manufacturing. Companies want to attract talent as they move up the value chain, not just as they start manufacturing operations." "We are now transferring this IT SEZ model to our developments in Pune and in Gurgaon," says Thomas Teo, CEO, India operations. "In Pune we have completed Phase 1 of 500,000 square feet of IT space, which is also an IT SEZ. SEZ policies frequently change, and we have to keep pace with these changes, and as long as options such as these attract potential customers, we will continue to develop them and serve our customers better. This is part of being an integrated community, where we provide the entire spectrum of real estate space for our customers." As head of Ascendas' India operations, Teo oversees customers' space needs no matter what they require. "Because of our parentage and our involvement with MNCs - we know their sentiments and their expectations - it will be easier for us to build the case that they need only look after their manufacturing or their core business and we will look after the real estate associated with that. And at the same time, we are adding the residential, the retail and commercial, because we believe in creating something that gives clients a place with which they can identify. Buying the land becomes as hassle-free as possible, land titles are as free and clear as possible, and we as the developer stay in place and maintain the property. It is a total understanding of real estate development that is our strongest advantage to investors from the U.S. or elsewhere." Applied Materials, an ITPB tenant, which has operated in India for 11 years, is a strategic partner and an enabler of the semiconductor and solar manufacturing ecosystem in India. Since it started operations in 2002, Applied Materials in India grew from a small liaison office coordinating IT service operations to the second largest engineering resource pool for the company globally in less than 10 years. Currently Applied Materials in India delivers IT services and is a key link in our global IT infrastructure footprint. Further, it provides design engineering, engineering support services, as well as cutting edge innovation in materials science and engineering through its strong partnership with the ecosystem in India. Applied Materials in India also hosts the second largest data center globally, at the ITPB site. Today the company employs approximately 2,300 people in India, including full time staff, contractors and associates - about 1,300 at ITPB Bangalore, 100 at Ascendas' Chennai facility and others in Delhi and Mumbai. "We selected India for a host of reasons, including high-end engineering talent availability, IT security and language skills," says Sonny R. Kunnakkat, Senior Director – Central Engineering & Head – India Site Operations, Applied Materials. "The decision to be in India was made on the capability the company saw and the ramp-up speed we wanted for the engineering and design work. We made the right decision too - today we host the second largest engineering talent base for the company globally." "We have a long relationship with Ascendas, and we are happy with the services and amenities till date, both at Bangalore and Chennai. To note one example, the quality of power that this park can offer because of the power plant helps us ensure zero service interruptions of our India data center which is one of the largest for Applied Materials," he added. First American (India) has a software development and BPO services unit operating in ITPB that employs about 3,000. An additional 800 employees work in Hyderabad in a similar capacity, says Narayan Rao, head of facilities and administration. "We have researched locations outside the Ascendas park, but to match this facility in terms of the infrastructure is not feasible, which is why we are continuing to be here in ITPB," says Rao. "It is a prime location for us, partly because we can attract the talent pool we need. It has a very high quality infrastructure, public transportation and a high level of security, which is the main factor." These considerations are very important to the parent company, based in Santa Ana, Calif., United States. "People want to work in the kind of environment present here at International Tech Park Bangalore. Ascendas is committed to providing the work environment we need," says Rao. "The scalability of space is always there, so it is easy for us to think in terms of expanding here at ITPB. There are no growth restrictions here." In fact, the company took an additional 9,000 square feet this summer. Animation and visual effects powerhouse Technicolor first came to India via a joint venture seven years ago. The Company subsequently took over 100 percent in 2009. "Technicolor encouraged the joint venture to find a site to build a CG animation facility that had the appropriate ambiance for artist and creative professionals," says Biren Ghose, country head, Technicolor India. "Eighty percent of our talent comes from other states in India, so a location in the middle of the city would have meant very high rental rates for their accommodation. Whitefield is an easier location for young people to get started, and the park has lots of amenities that are important to them. A rendering of Ascendas' integrated industrial township now under development in Chennai, India. "From a business perspective today," Ghose continues, "there is one big advantage to being in ITPB, the fact that it generates its own power. As far as I know it is the only park in Bangalore that does so. This is very important to what we do, given the large files we work on creating and processing frames and the amount of data we transmit to London and Los Angeles almost 24/7. One second of interrupted power will prevent us from meeting those deadlines," he says. Four data centers are resident in Technicolor's ITPB space, which spans five floors of a building in the park. These floors are equipped with the highest-end workstations available, says Ghose. "What we do is totally driven by artistry and creativity, but the technology power plays an equally huge part in it. This is an expensive location. We pay a premium to Ascendas compared to what we would pay elsewhere for space, but we have uninterrupted power, maintenance, upkeep and a good environment for artists. Additionally, the Ascendas' customer service culture is definitely in evidence here." Ghose says India does not offer the creative industries incentives as do other countries in the region, including Malaysia, Singapore, Korea, Taiwan, China and others. "We have to reckon with real costs. As talent costs rise, and that is the core of our business, we have to look at where else we can save. So we evaluate our space at Ascendas very carefully every three to five years before agreeing to commit on renewals." That decision, he adds, is made by Technicolor headquarters which also has a global real estate management team with recommendations from local management. It is possible, he says, that the company will need to expand by about 25 percent in the next three years. Ascendas' plans for India, and the rest of the markets it serves in Asia, revolve around building space its industries will require in the future, says Aylwin Tan, chief customer solutions officer. "Our mission is to create total business environments so that the people working there can excel. It is about future-ready business space," he maintains. Multinationals' space requirements are evolving in many parts of Asia from low-cost manufacturing to R&D campuses and IT parks. Ascendas can work with investors efficiently and flexibly in helping to secure the space they require as their business models evolve. "The fact that we are owned by Singapore's Ministry of Trade & Industry means we operate under greater transparency, which multinational clients value greatly," says Tan. They also value Ascendas' local presence in so many markets, he adds, which delivers insights into how areas within a country are better suited to particular functions - southern India for manufacturing with notable pockets of high-end IT services, such as Bangalore and Chennai. "We can deliver the same quality experience everywhere in Asia with customized solutions for our clients." International Tech Park Bangalore is Ascendas' flagship India IT park. Lifestyle amenities onsite include a health club, restaurants, shuttle bus services, shopping mall, medical offices and banks, among others. Rick Lam is director of real estate and facilities solutions for Pfizer's Asia-Pacific region, overseeing a commercial portfolio of about 250 properties. In the wake of the pharmaceutical giant's merger with Wyeth in 2009, Lam says his group looks actively for opportunities to reduce space and lower occupancy costs. "We are very much operating in a cost-reduction mode," he notes. Ascendas' focus on business parks will match Pfizer's needs in some cases. "They know the economics and how to develop good office space. We know that wherever we occupy Ascendas space that we are in high quality buildings." As Pfizer changes its strategy in certain markets, as in India, Lam says Ascendas' flexibility and professionalism are highly valued. "They are not necessarily the low-cost option, but because of the quality and locations, it is worth a premium. We could pay less to go farther away, but we would be less sure of the quality of the location's management." This Investment Profile was prepared under the auspices of Ascendas Pte Ltd. For more information contact Aylwin Tan via email at aylwin.tan@ascendas.com, or visit www.ascendas.com. 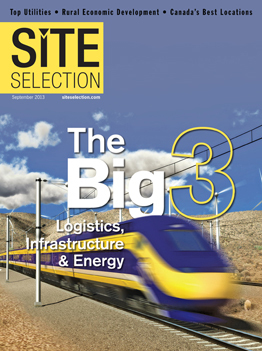 Part 2 of this Investment Profile, to appear in the November issue of Site Selection, will cover Ascendas' solutions in Singapore and China, and will feature corporate input from multinationals operating in those markets and throughout Southeast Asia.